Nowadays aircraft noise levels are an issue and many Nations have made noise reduction mandatory with Legislation. The need for Pilots to be good neighbours with the local population around airfields is becoming important as local noise abatement groups lobby the Government to act. New Aircraft are designed with acceptable noise levels; however it is the old aircraft which require a retro fitted system to achieve a reduction in noise level. GOMOLZIG have been proactive and have developed Quiet Flight. 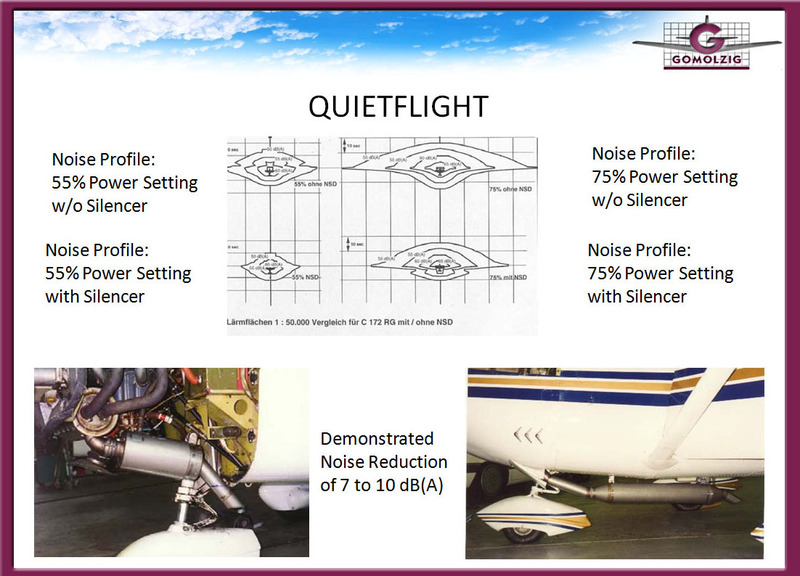 Quiet Flight is a Retro-fitted Muffler system designed to reduce the noise levels of General Aviation aircraft. The physical processes of Reflection and Absorption are major factors which impact on sound levels. The frequent Reflection of sound waves decreases the intensity. The kinetic energy of Sound waves is converted in to thermal energy by Absorption; contact with a solid body. Find the optimum between physical effects of Reflection and Absorption; this is the key to reduce noise levels. Absorption nearer to the source of emission is the desired and best solution for achieving a noise reduction; to this aim GOMOLZIG have modified and re-engineered the Exhaust and Muffler systems of many types and models. There is nothing we can do about the terrain aircraft operates over. Physically the developed systems either are engineered to fit in the engines compartment and under the cowlings or fit external under the fuselage. Some aircraft types both methods are available. An established view is that sound absorption systems results in power lose; this is not the case. The fine tuning and improvements in exhaust gas flow generate gains in gas energy and reduce noise. On the older and inefficient types, performance increases are noticeable with the fitment of a Quiet Flight system. As part of the certification of every new Quiet Flight system, we must demonstrate that the system during critical flight conditions doesn't change the original performance and handling. This is to ensure that there is no perceivable performance loss compared to the original system. The Quiet Flight systems are manufactured from Stainless Steel. In areas of high Thermic and Dynamic loads, specialised and specific alloys are used. The selection of these materials is to ensure that the Quiet Flight performs efficiently during varying flight and weather conditions and will remain reliable. Quiet Flight systems are designed for ease of maintenance and the replacement of components has been simplified. All Quiet Flight systems have full spare part support with short lead-times. When you fit the Quiet Flight to your aircraft, part of the supplied information is an amendment for the Maintenance Schedule for your aircraft type. This specifies the flying hour inspections and any replacement of components. To check the applicability of fitting a Quiet Flight system to your aircraft and get a quote, please visit prodcuts or contact GOMOLZIG in Germany or one of their Representatives in UK, FR or North America right here.